Find a glossary, timeline, audio files, historical facts and much more relating to the jazz genre in this section of general resources. Jazz Resources Library – From the Thelonious Monk Institute of Jazz comes this online library full of helpful resources. Find a jazz timeline, musician bios, audio snippets and much more. Jazz Glossary – Follow the link to find an alphabetized glossary of jazz terms, which is provided by The Center for Jazz Studies at Columbia University. Jazz – The First 30 Years – Learn about the first three decades relating to the history of jazz via this link that includes photos and helpful links. Styles of Jazz Music – Discover the 25 different styles of jazz music in this detailed two-page guide that includes a description of each style and its history. JazzWorld.com – Discover a “passionate online community” that brings together fans and artists all over the world. Contemporary Jazz – The contemporary jazz genre is the focus of this blog, which was at its peak between 1980-2000. Elements of Jazz – Explore new jazz music, learn about the current musicians and vocalists and more on this interesting blog. Top 25 Jazz Events and Jazz Festivals in the USA – Find names, short descriptions and links to the 25 best jazz events and festivals in the United States. 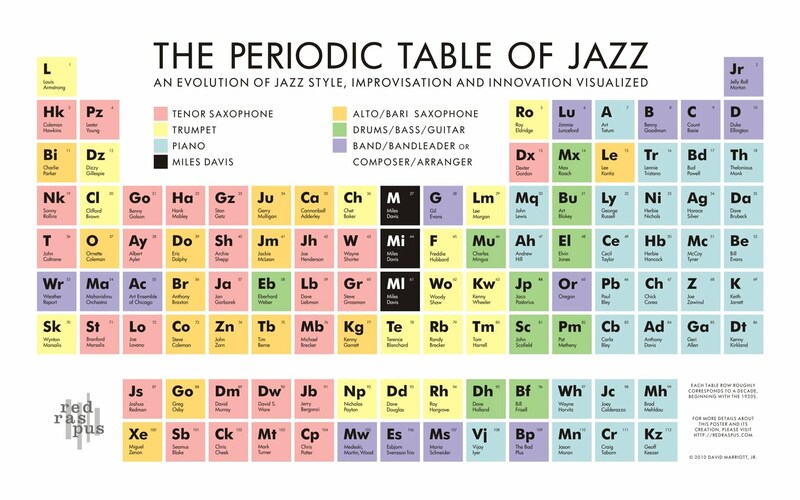 The Periodic Table of Jazz – Check out this cool infographic that is organized by decades and includes almost every jazz artist of significance. It doesn’t get much better than listening to jazz in the place where it all began – the birthplace of jazz. Find out where the best listening spots in the city are below. New Orleans Jazz and Heritage Festival – Every spring, people can witness legendary and up-and-coming artists in the jazz genre via this annual festival. Preservation Hall – Immerse yourself in living tradition by taking in an intimate, acoustic jazz concert in the French Quarter at this historic hall. Top 10 New Orleans Jazz Clubs – This guide offers information about the top 10 jazz clubs in the city. Expect to find lounges, restaurants, listening rooms and more. New Orleans Online – Follow this link to find a search feature that will allow you to find jazz clubs or bars by name, dress code requirements or neighborhood location. Jazz is an important part of Chicago’s history and is still very much a part of the city’s culture today. Browse the links to find a jazz venue or event. Chicago Jazz Venues – This resource offers an alphabetical list of Chicago jazz venues, addresses, telephone numbers and links to each venue’s webpage. Jazz Music Event Search – Search for jazz music events all over Chicago by simply specifying a date and location. Jazz Showcase – Check out the oldest historic jazz club in Chicago, which is still a thriving hotspot for top international jazz stars and amazing local talent. 13 Best Jazz Clubs in Chicago – If you’re planning on visiting Chicago to take in some jazz music, check out this list first to find out about the top jazz clubs in the city. New York City is full of things to do and see, including amazing jazz performances. Learn about some of the best destinations in the city below. The Best Jazz Clubs in New York City – Live music venues about in New York City. Yet, you want the best. Find out where those venues are by following the link. NYC’s Best Jazz Clubs – From CBS New York comes six favorite jazz clubs, which range from small hideaways to large auditoriums. Jazz NYC: The Best Places to Listen – No matter what type of jazz music you’re in the mood for, you can find information about a great venue that meets your needs here. Hot House Jazz Guide – Make this link a go-to for finding helpful information about the best New York jazz clubs, concerts and festivals. A Place for Jazz – This site offers links to the months of the year where you can discover the location of different jazz festivals that are within a day’s drive of New York State’s Capital District. This eclectic jazz destination might have you grooving in the streets. Check out the possibilities below. Pittsburgh Jazz Live International – This annual event offers a laid-back and inviting vibe with its mostly free concerts in the streets of the Cultural District. Andy’s Wine Bar – Located on Market Street, this wine bar doesn’t charge a cover and offers an experience that celebrates the legacy of Pittsburgh jazz. James Street Gastropub and Speakeasy – This family-owned bar and restaurant located in Pittsburgh’s historic Deutschtown boasts the best live and local jazz artists in Pittsburgh. Top Places to Listen to Live Jazz in Philadelphia – Find 24 jazz destinations mapped out in this birthplace of some of the jazz greats such as John Coltrane and Dizzie Gillespie. A trip to the nation’s capital wouldn’t be complete without visiting at least one jazz venue. Check out some of the city’s best offerings below. The Best Jazz Clubs in DC – Discover 11 of the best jazz clubs in DC, which include lounges as well as historic music halls. DC Jazz Festival – Beginning in 2005, the DC Jazz Festival became a provider of jazz performances and programs that often serve as an introduction to the genre for students and adults. Smithsonian Jazz – Smithsonian Jazz at the National Museum of American History offers world-class collections, exhibitions, concerts, programs and more. 5 Jazz Venues in DC That Are the Bee’s Knees – Step back in history or enjoy jazz in a more modern environment. Check out some of the best jazz venues in DC. Jazz Travel Resources Outside of the U.S.
Planning to travel abroad? Utilize this section to find some of the best jazz destinations on the planet. The 10 + 1 Best Jazz Clubs in the World – While the first two jazz clubs on this list are located in the United States, the others span the globe. Jazz in Havana – Check out these four venues that stand out as some of the best among Havana’s thriving jazz scene. 10 of the Best Jazz Clubs in Europe – Find well-written synopses that will give you information on the 10 best jazz clubs in Europe. The 7 Best Jazz Bars in Amsterdam – Back in the 1970’s, jazz clubs started appearing in Amsterdam, and many of those are still considered some of the best today. The 20 Jazz Festivals around the World – Discover 20 of the world’s best jazz festivals. Some are world-famous while others are lesser known but worthwhile. From learning about the latest albums to discovering up-and-coming talent, these podcasts will keep you jazzed. The Cool Jazz Countdown – Get the weekly lowdown on the top jazz albums of the week on this podcast hosted by Marcellus Shepard and Kyle LaRue. Piano Jazz Shorts – Marian McPartland hosts this podcast that offers interviews and improvisations with some of the brightest stars in the world of jazz. Jazz after Dark – Join host Don Shor as he takes you on a journey through the many faces of jazz such as blues, ragtime and bebop. In the Groove, Jazz and Beyond – Listen to current and past jazz masters as well as those who are just making their mark in the modern jazz and fusion genre. Smooth Jazz Affair – Check out this podcast, which is dedicated to broadcasting independent smooth jazz music.